Union Sportive de Beau Bassin Rose-Hill celebrated the title at the Indian Ocean Club Championship Cup. 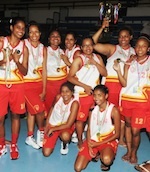 They overcame Mont Fleuri at the Palais des Sports in Roche Caiman in the Final. Mont Fleuri eked out a 32:30 halftime lead. But Union Sportive pulled ahead for a 53:49 lead at the final intermission. They rallied to the victory at the end. Marie-Julie Laplanche scored 17 points to pace the winners. Caroline Adeline had 16 points and 12 rebounds for the champions. Jana Malbrook responded with 23 points for Mont Fleuri. South Africa clinched 11th place at the 21st FIBA Africa Championship for Women. In their last game the team beat Mauritius 60:36 in Madagascar. This was the second appearance for both teams at the tournament as in Round 2 South Africa and Mauritius battled for the first victory at the FIBA Africa Championship for Women in Day 2. South Africa looked much better in the court to smash the opponents 70:29 for 1-1 record. Last night South Africa started with 16-6 in the opening quarter and never looked behind after. South Africa allowed the opponents to score another 6 points in the second frame, while they increased to 33:12 at the halftime. In the third period the favorites produced 16-8 that gave them 49:20 after 30 minutes of the game. Mauritius however managed to win the last quarter 16-11 at the end of the campaign. South Africa made 12 steals in the game, while Mauritius had 9. The latter however comminted less turnovers in the game 18 versus 20. Blessed Mtsweni top-scored for the winners with 13 points to finish at the 11th spot with her team. Itumeleng Khoabane (87) and Nosipho Njokweni followed her with 10 points apiece. Vanessa Speville ended up with 15 points in the losing effort. Corinne Somauroo produced 13 points for Mauritus that finished on the 12th position.